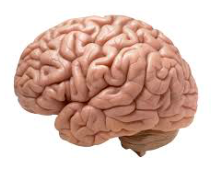 The excerpt from a new study, published in the open-access journal Frontiers in Human Neuroscience, shows that older people who routinely partake in physical exercise can reverse the signs of aging in the brain, and dancing has the most profound effect. During the last three days the blog posts have been about the dance education residency that happened during December 2016 in MSAD #33. The “Hopes for the Future” funding came about thanks to the Thornton Academy dance program and seven dance programs in southern Maine. Almost $3,000 was awarded to MSAD #33 in Aroostook county where students in K-12 benefited from the expertise of a teaching dance artist. This year over $3,500 was raised by this same group of programs at a performance at Thornton Academy. Next month another school will be having a performance and contributing the funds to the “Hopes for the Future” to provide dance education grants to other schools/districts. The Maine Arts Commission (MAC)will administer this grant. Please watch for the information on this blog and the weekly MAC arts ed list-serv. Photo from the NEFA site. Click on the tag line below for the information. The information below is from the New England Foundation for the Arts and is about how dance is moving forward. In November 2016, New England Foundation for the Arts (NEFA) released a report by Metris Arts Consulting, entitled Moving Dance Forward: NEFA’s National Dance Project at 20 & Critical Field Trends. The report is located at http://www.nefa.org/moving-dance-forward. The report is a comprehensive evaluation of the National Dance Project, incorporating new research about current needs of the dance field on the occasion of the 20th anniversary of the program. NDP’s intertwined support for creation and touring has provided robust and sustained support in an environment of increasing resource scarcity and rising costs; investing in artists to make work is regarded as the highest priority for the program. Dance presenters credit NDP support with improving their reputation locally, their knowledge of dance, and enabling them to take risks by introducing new artists to their audiences. Data reveals NDP has consistently supported artists of color, but focus group findings speak to continued systemic inequities that exclude some artists and ways NEFA and other grantmakers can further equitable and inclusive grant-making. Artists tour to an average of six communities for each five-year period of NDP’s grantmaking from 1996-2016, revealing that tour subsidies are a high-impact bulwark to a field-wide decline in touring opportunities over the past two decades. Touring is no longer motivated by economic considerations; instead, artists are primarily motivated to tour to connect with new audiences, and organizations cite mission-based commitments and dance’s ability to connect audiences to diverse cultures and ideas. Artists and organizations value community engagement as an important component of touring and foresee deepening this practice over the next five to ten years. The full report may be found online at www.nefa.org/moving-dance-forward. Lubec teachers and Washington Academy (WA) collaborated to dance for a surprise school wide assembly. The surprise was complete with gleeful clapping, hoots and wows from the student population. Their performance was followed by Gaetani leading the entire PK-8 school in 4 line dances. Connie Bagley is Lubec’s Art Teacher and gifted and talented Coordinator. She led Lubec’s staff in learning a line dance to “Happy Song” by Pharrell Williams. WA Dance “Guru” Gina Gaetani helped Bagley with choreography and had come to Lubec with her WA dance students to help teach the Lubec staff and then again to dance with them. Bagley says the point of the Dance Project was to model creativity, arts integration and open mindset. Her idea to create Professional Development for teachers was for “Brains on Fire” a graduate class she is taking with Catherine Ring and the New England Institute for Teacher Education. Here is the public link https://prezi.com/dashboard/ to a Prezi she presented to teachers under her name Connie Harter-Bagley and is titled “Gifted and Talented Lubec”. Connie has a dozen Art related Prezis to share. Thank you Connie for providing this blog post that provides food for thought for other educators. National Hispanic Heritage Month is celebrated from September 15 to October 15 in the United States. It celebrates the Latino citizens of the United States and where they came from. The Camden-Rockport Middle School holds an assembly in mid-October for this celebration. Under the auspices of a Bisbee Grant, Erma Colvin, a Maine-based dance educator works with all the 8th Grade Spanish students in teaching them dances from Hispanic countries. They spend three weeks in the fall preparing for a school-wide assembly. This year dances from Columbia, Mexico, Spain and Argentina were taught. Part of the grant stipulated that the dances be taught in Spanish. This was accomplished with the help of Aaron Henderson, the 8th Grade Spanish teacher at CRMS and Nohora Estes, a native Spanish speaker who teaches Spanish at the Riley School in Glen Cove. She worked with Erma and Aaron on dance vocabulary to teach the students. 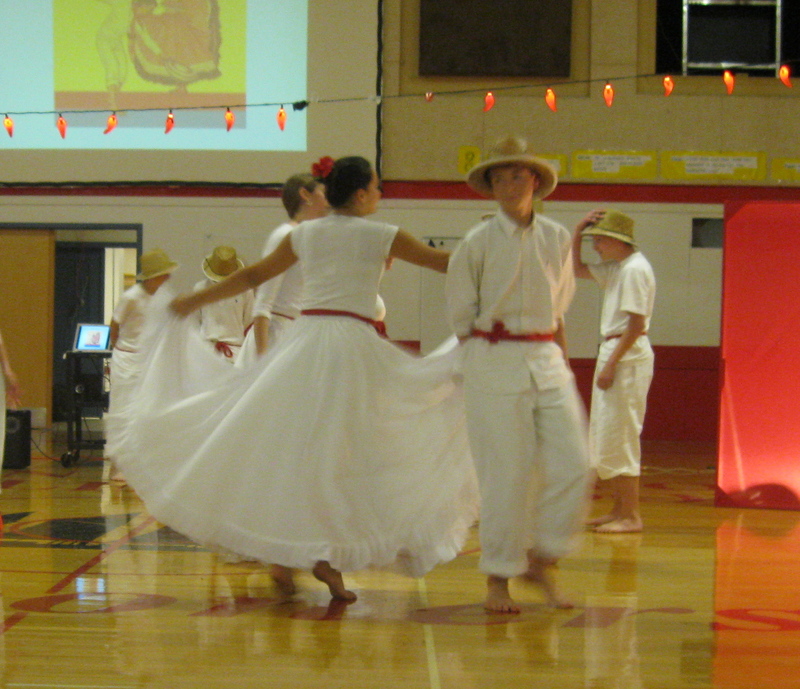 Participation in the dances was part of the students grade requirement. Authentic costumes were created. The CRMS Tech Club provided technical assistance in setting up the performance space. Thank you to Erma Colvin for providing this post. Four academic classes from Brewer High School and Bangor High School have been working on original dance and drama pieces for the past several weeks, and will be performing them for the public on Wednesday, November 20 in Orono. The students’ creative work is part of “Building Community Through the Arts,” a program organized annually at these schools by the Maine Alliance for Arts & Education (MAAE). The artist residency program, now in its fourteenth year, brings professional Maine choreographers and playwrights into academic secondary school classrooms to help students create group works which combine curriculum themes with the social issues the students themselves choose to address. At Bangor High School this year Susannah Owen’s sophomore English class has been creating a dance piece based on its reading of Steinbeck’s “Of Mice and Men,” and Michele Benoit’s Introductory Chemistry class is creating a dance based on the behavior of elements. Both classes are working with Maine choreographer Katenia Keller. At Brewer High School Michelle MacDonald’s two creative writing classes are creating works of drama with Maine playwright/ director Jeri Pitcher. For most of the students this is their first experience in creative theater and dance. You have got to take 2 minutes and 51 seconds to see this post from the Huffington Post.